Last night saw the biggest shock of the World Cup so far (yes, even more shocking than England winning a game by five goals) when South Korea sent cupholders Germany crashing out of the competition. Naturally, the good folks on Twitter had a lot to say about this unexpected turn of events. The professionals over at FOX Sports Brazil, whose national side were beaten by Germany 7-1 in their last World Cup campaign, were the first to offer their congratulations. 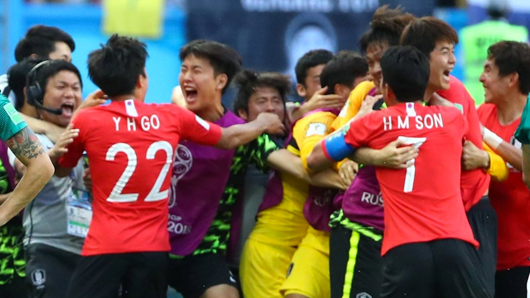 The unbelievable moment South Korea scored twice in added time was deemed worthy of a soundtrack. But none of those versions beat the beautiful original audio courtesy of South Korean commentators. Speaking of music, South Korean pop sensation BTS suddenly found themselves climbing the Mexican charts and invited to carne asadas. In person, Mexican fans seemed to have a sudden and collective urge to find anyone of South Korean ethnicity to join their celebrations. Mexican fans outside the Korean Embassy in Mexico City even celebrated with the ambassador, downing tequila shots together. Mexico and Sweden fans, who started the day on opposing sides as they fought for what they believed was only one qualifying spot – became the best of friends. And best of all, everybody loves South Korea now.